Today is New Year's Eve. This is a day that is celebrated around the world as we welcome a new year. However, in my family it was important for another reason. It was my Dad's birthday. You died back in 1991, but you are always near in my heart. When I was a little girl you held me when I skinned my knees, which was often. You always encouraged me when I would draw because you thought I was good at it. You were always encouraging no matter what I wanted to do. Whether it was moving to Texas, dating a new guy (as long as you thought he was good enough), or joining the police force. You weren't very good with money, but you tried very hard to make a decent life for me and my brother. You stayed with us during the difficult times back in 1965. I'll always be grateful for that. We didnt always agree, but then what teenager ever does. 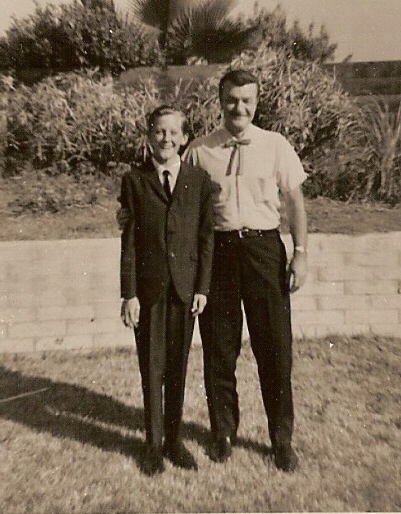 Raising two teenagers as a single father must have been very difficult. We only knew what went on in our lives...all the drama that goes with the teenage years. I never thought of what you must have been going through. You loved us very much, of that I have no doubt. You could tell a good story and you must have known a thousand jokes. Well, I miss all that and I miss you. So Happy Birthday to you Dad. Here is my TIP to you today. Time goes by very quickly in our lives. Talk to your grandparents, parents, aunts & uncles while they are still here. Ask them questions about their lives. Buy one of those books that have questions in them and have them fill it out. Go through old photos with them and make sure there are names & dates on the back of ALL the photos. I did this with my Dad only a little bit and I wish I'd done more. A photo is not worth a thousand words, unless you know who's in it. When you are in your teens and 20's and even your 30's you don't think it will matter all that much what happened in the past. But.....then one day, they are all gone and you are left with photos and memories and suddenly you want to know more. How did your grandparents & parents meet? Did they go on a honeymoon? What were their interests & hobbies? Did they travel? If so, where did they go? Don't let these questions go unanswered while you have them here - ASK THEM NOW. You will never regret it, I promise. 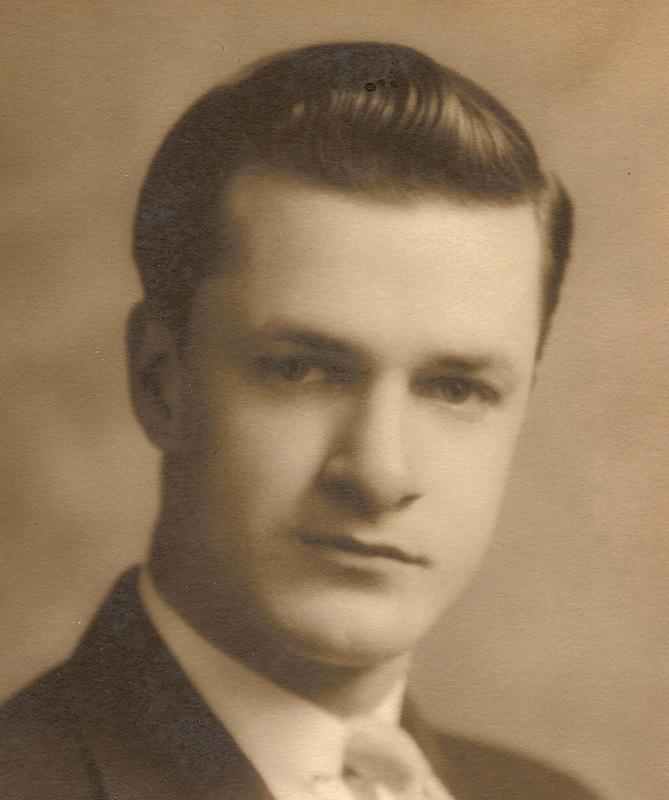 Back on November 20, 2012, I wrote to you about how to find a maiden name & locating a marriage record. 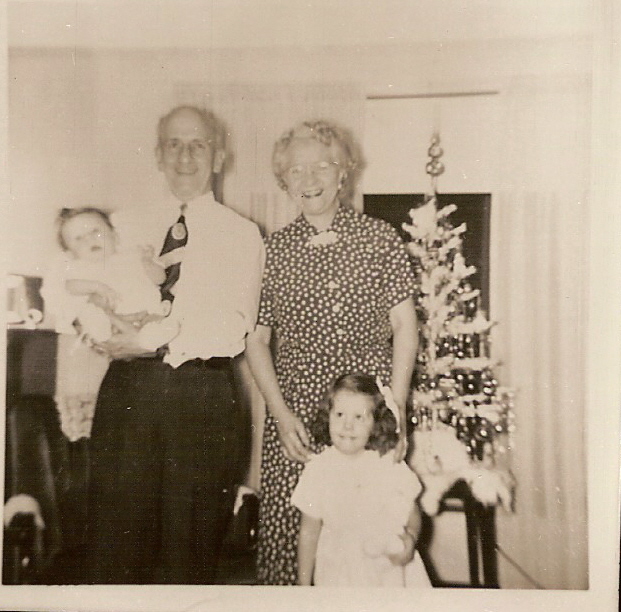 I specifically referenced Charles E. LUNSFORD & his wife, Myrtle. I located a marriage index on The Lawrence Register that fit the timeline and the names were C. E. LUNSFORD & Myrtle WISEMAN. Next, I asked a contact that I have back in Lawrence County if they would mind looking for a marriage record next time they went to The Briggs Library in Ironton. She agreed and said she would be visiting in the next few days. The Briggs Library has a genealogy room, called the Hamner Room, that is loaded with records, books, maps & family histories from Lawrence County & the surrounding area. I visited the library last July when I was in Ohio. Great place! 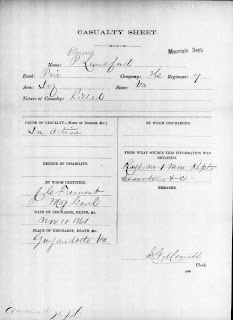 A few days later, the marriage record came in the mail. Waiting for a record to come in the mail is always exciting .... well, at least for me it is. Did I get the information/confirmation I needed from this record? Is Myrtle's maiden name really WISEMAN? Here is the marriage record. You decide. 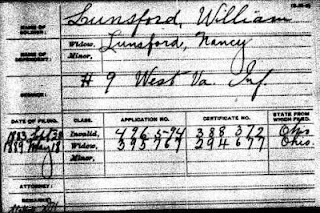 In examining this record I look for evidence that this is the correct Charles Lunsford & his wife Myrtle, who's last name may be Wiseman. 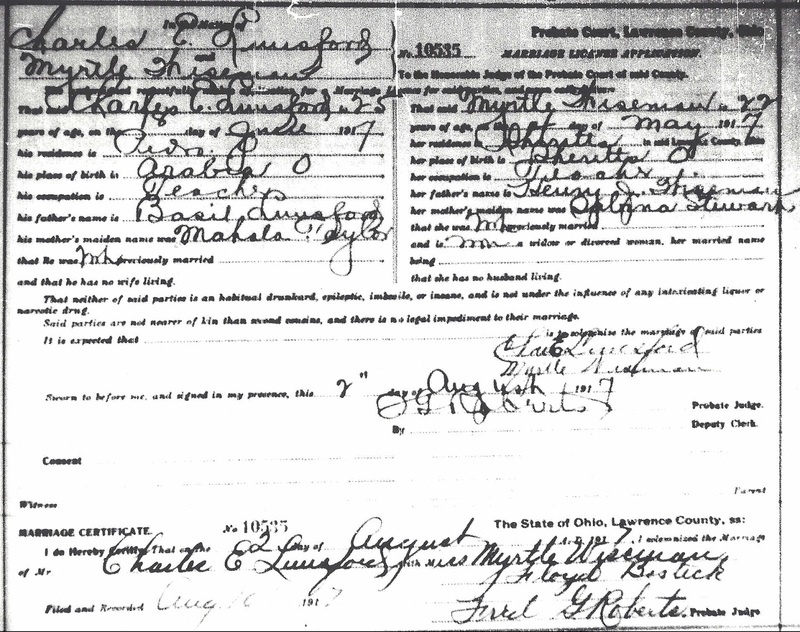 After seeing that this is indeed the marriage record of Charles E. LUNSFORD & Myrtle WISEMAN, the next thing I looked for were parents names for the bride and groom. 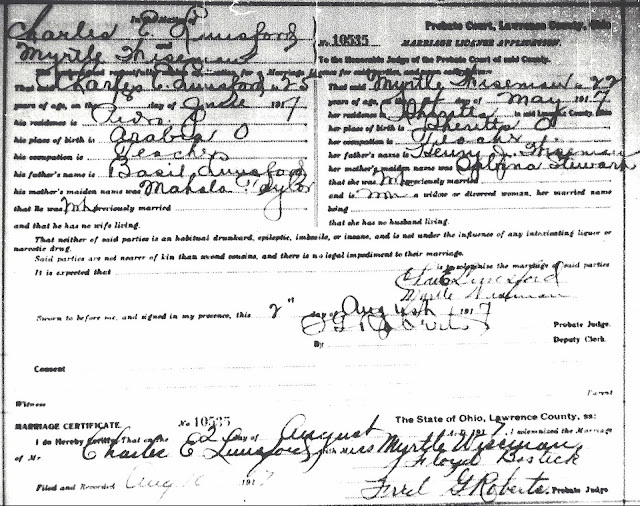 Charles' parents names are listed as Basil LUNSFORD & Mahala TAYLOR. Those are the names I have for his parents, based on census records and his birth record. His age is listed as 25 years, another match to his birth record. Myrtle's parents names are listed as Henry J. WISEMAN & Sabrina STEWART. This is the first time I've seen reference to her parent's names, so that will require further research. 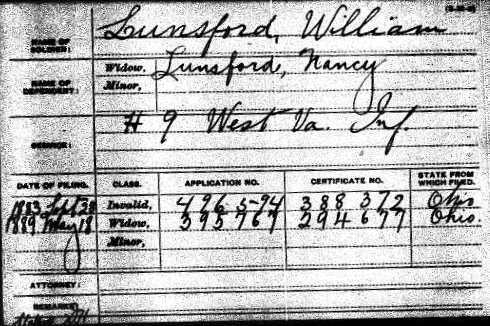 Her age on the marriage record is 22 years which is a close match to what is listed on the census records for her and Charles. Can I now locate Myrtle's birth record? Answer - Not yet. 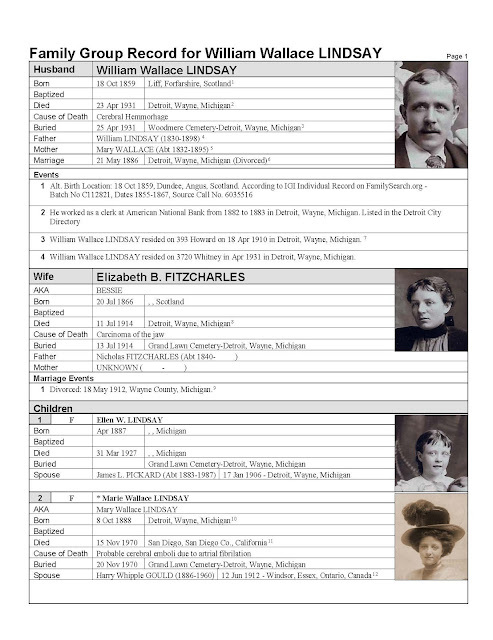 Am I able to connect her with these two people by finding her in census records with them? Answer - YES! I have found her living with her parents, Henry & Sabrina WISEMAN in the 1900 & 1910 census records in Lawrence County, Ohio. CONCLUSION - Based on these pieces of evidence, I do believe that I have located Myrtle's maiden name & her family. One piece of evidence is ok, two is better and three is more to the standard we are seeking. There are more records that I may eventually locate with further evidence of Myrtle's maiden name - such as her birth record and her death record. But, for now, I'm satisfied. I hope this helps you in finding those elusive maiden names. There are more tricks up my sleeve and these aren't the only ways we have to find maiden names. This method worked for this particular person. I hope that you each have a blessed Christmas with family & friends. It's a time to love those we hold dear and to remember all our loved ones who are no longer with us. Here are a few photos from Christmases past. 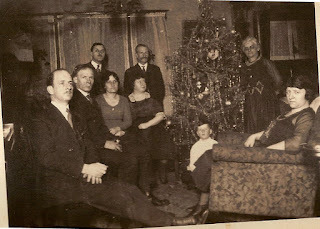 Circa 1913 - My Dad is the little boy on the left and in this photo are my grandparents, Harry & Marie Lindsay Gould and my great grandparents, Val & Mae Thorp Gould and some grandaunts. 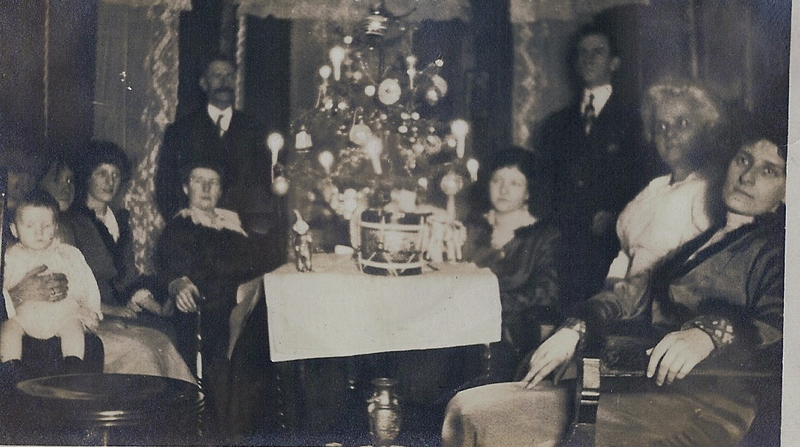 This picture is from about 1918. 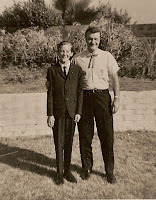 My Dad is the young boy and again my grandparents, great grandparents and grand aunts & uncles. Don't I wish I could hug my grandparents or my Dad again? My Mom is still with us, so her I can hug. 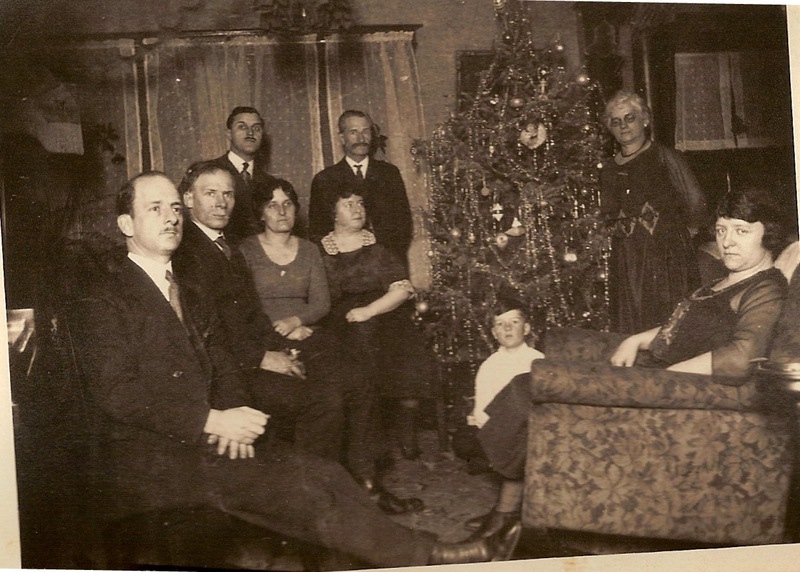 Enjoy your time with family & we'll talk about genealogy again soon. A 10 year search ends! 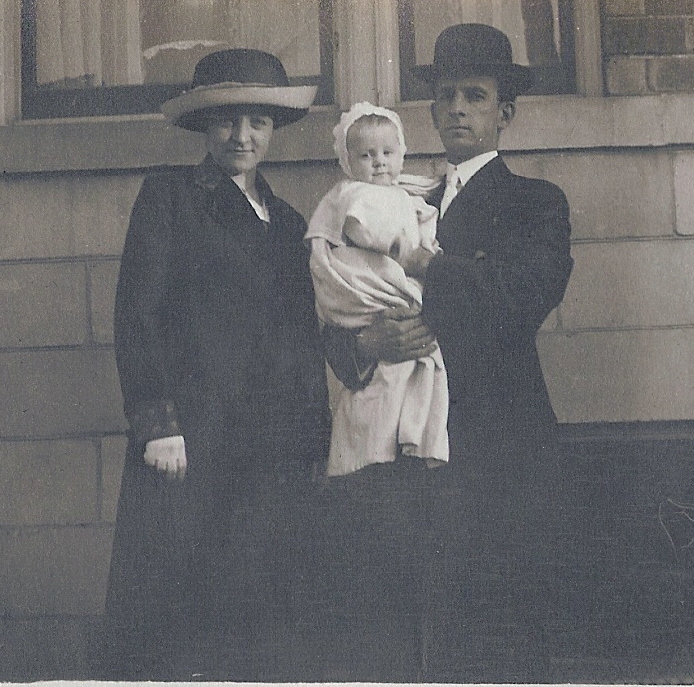 Elizabeth "Bessie" Fitzcharles Lindsay - This is her name. She is my Great Grandmother. Grandmother to my Dad. Born in Scotland in 1864. Married to William Wallace Lindsay. Mother of 4 children (that I know of). 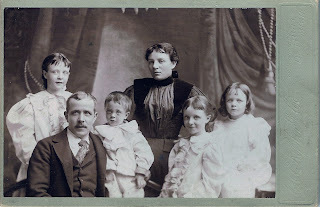 Those children were: Ellen W. Lindsay, Marie Wallace Lindsay (she's my grandma), Bessie Lindsay and William F. Lindsay. 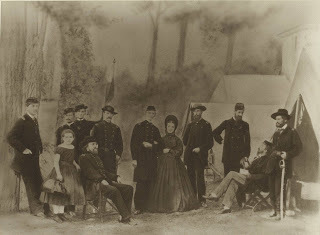 I have one picture of her, taken with her husband and 4 children in about 1896. For the past 10+ years I have wondered who Elizabeth Fitzcharles' parents were. I knew very little about her. My grandmother passed away in 1970 and my Dad in 1991. I sure couldn't ask them. I knew some things about her life and death. She married William Wallace Lindsay on 21 May 1886 in Detroit, Wayne, Michigan. I believe she came over to the United States in April 1886. I have an immigration record that seems to match and dates from various census records that are close to that immigration record. TIP: In genealogy we learn that dates don't always match exactly. Sure...if they do, it's a plus, but they often don't. That shouldn't stop you in your research. Dates can be wrong for a number of reasons. The person giving the date doesn't give the correct one, the person taking the date transcribes it incorrectly or the date is just a guess. I knew that her husband filed for divorce in 1912 and that she died in 1914 of cancer of the jaw. I know she is buried in the same plot as my grandmother and grandfather and other family members. How do I find out who they are? I wasn't sure how to answer those questions. Working with the records overseas is a learning process and I'm still learning. 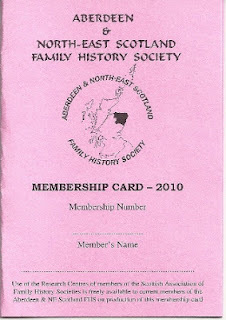 I had tried over the years to locate records on various websites, such as Ancestry.com or scotlandspeople.gov or familysearch.org. No luck on any of them. Here's what happened. About a month ago, my cousin, Paula, told me that our 2nd cousin was taking a trip to Scotland. Paula (who, by the way, is now hooked on genealogy, gee, I wonder how that happend? ), thought that I should talk to Debbie before she went to Scotland, so I could give her some family information. 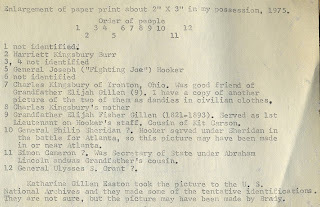 I contacted Debbie and sent her a family group record for William & Elizabeth Lindsay. TIP: Family Group Records are reports you can create from your database with just a click or two of your mouse. Note: the name of Elizabeth's father is given as Nicholas Fitzcharles and her birthdate as 20 Jul 1866. His name & her birthdate are listed on her death certificate. This group record gave Debbie the information on the family that she would need to do any research while she was in Scotland. Keeping in mind that cousin Debbie is not a genealogist. All I said to her before she left was, anything she could find would be greatly appreciated. Debbie returns from Scotland and notifies me and Paula via email, that she has found some information that she thinks we will like. I told her if she'd found anything on Elizabeth Fitzcharles that I'd book a flight and come back there and give her a hug. She told me "book the flight." Course now I'm very excited and can't wait to hear of her discoveries. But, we decided that we would share this information via 3-way conference call on Monday. That was 3 whole days I had to wait. Kinda like Christmas. The anticipation is part of the fun. Monday morning, 9 a.m. The phone rings and it's my cousins Paula & Debbie on the line. 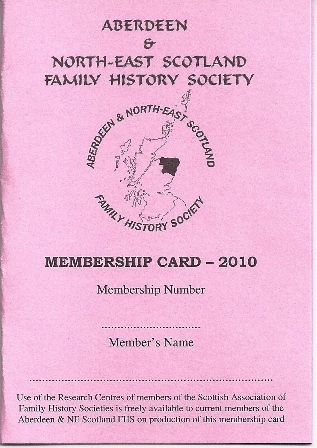 Debbie says that while she was in Aberdeen, she had time to stop in at the Aberdeen & North-East Scotland Family History Society. She mentioned my name and said that I was a member there. The helpful volunteer looked in their files and found my name and........da da....the family pedigree chart I had submitted with my membership in 2010. Unfortunately, I had not renewed my 2012 membership. Lookups are free for members. So, what does Debbie do? She joins. The cost is only $25 and saves any hourly fee charged for looking up records. The volunteer begins looking through records for anyone named Nicholas Fitzcharles who had a daughter named Elizabeth or Bessie or Betsy, born about 1866. No Nicholas Fitzcharles anywhere in the records. HOWEVER, there is a John Fitzcharles & Elizabeth McGovern who gave birth to a little girl named Elizabeth on 24 Jul 1864 in Alyth, Perth, Scotland! The record even gives the dates of the marriage of John Fitzcharles & Elizabeth "Betsy" McGovern as 6 Oct 1854 in Dundee, Scotland. I'm beyond excited. There it is - the elusive clue, something to work on, a trail to follow, information to try and verify. This is all we ask for as Genealogists. Next Step - Try to verify this information by finding vital records and census records. 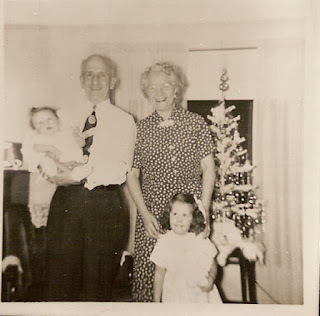 UPDATE - Since writing this post I have located all the documents necessary to affirm that John Fitzcharles and Elizabeth McGovern are my great grandmother's parents. Lately it seems I've been running across a lot of ancestors who served in the Civil War. Since I'll soon be making my first trip to the southern California National Archives center, it's a good time to review these files. I've always found the Civil War to be fascinating study. Very sad, for sure. Brothers killing brothers and families torn apart. The majority of my ancestors who did fight, were fighting for the North. A few fought for the south. Just a matter of geography really. My ancestors lived in the northeast or migrated to the midwest states. Migration patterns are a subject for another day. A few of them were right on the cusp, living in northwest Virginia, which became West Virginia in 1863. Here is a photo shared with me by my cousin Amy (who lives in Denmark). 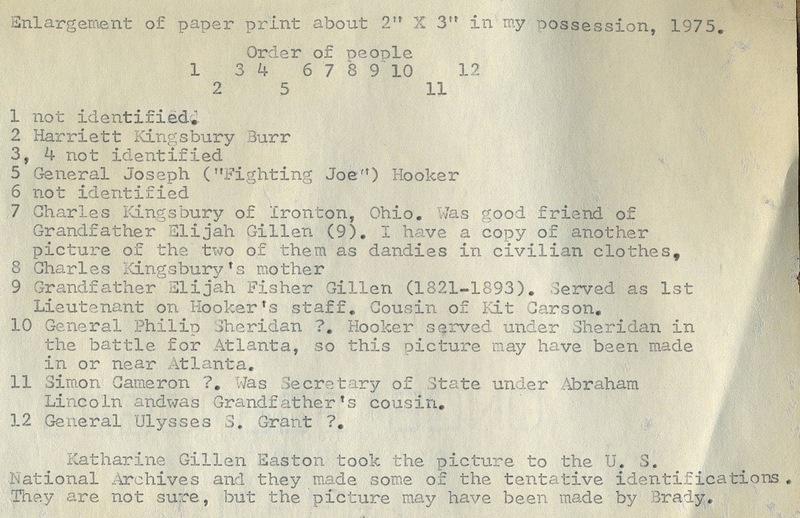 My ancestor is the one identified as #9 in the photo, Elijah Fisher Gillen. 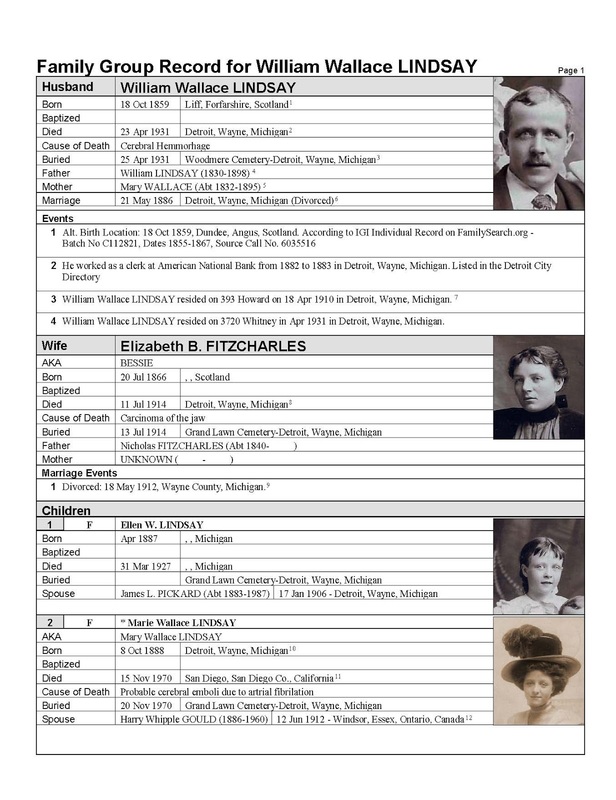 Elijah is my 3rd Great Granduncle. 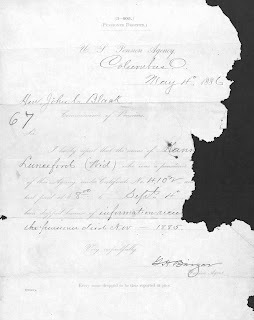 So, where do we find these Civil War service & pension records. 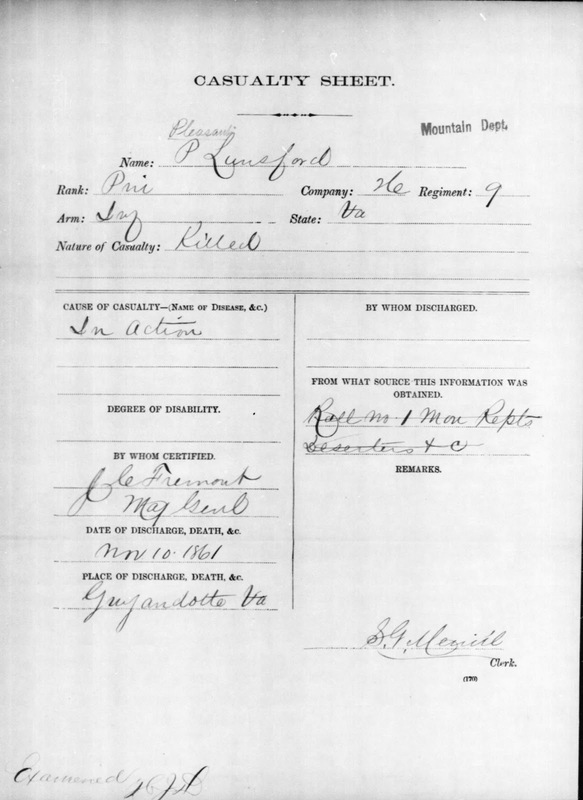 You can check first at Ancestry.com Records of more than 6 million men who served during the Civil War and over 2 million pension files can be accessed on the Ancestry.com site. If you want to be able to annotate images, share them with others or create a gallery of images you'll need to pay the annual subscription fee for "full access." This fee can vary. If you belong to a genealogical society you can sometimes get a deal. I'm sure there are other ways to get discounts too. The cost is not horribly expensive. I paid $39.95 for full access for a year. 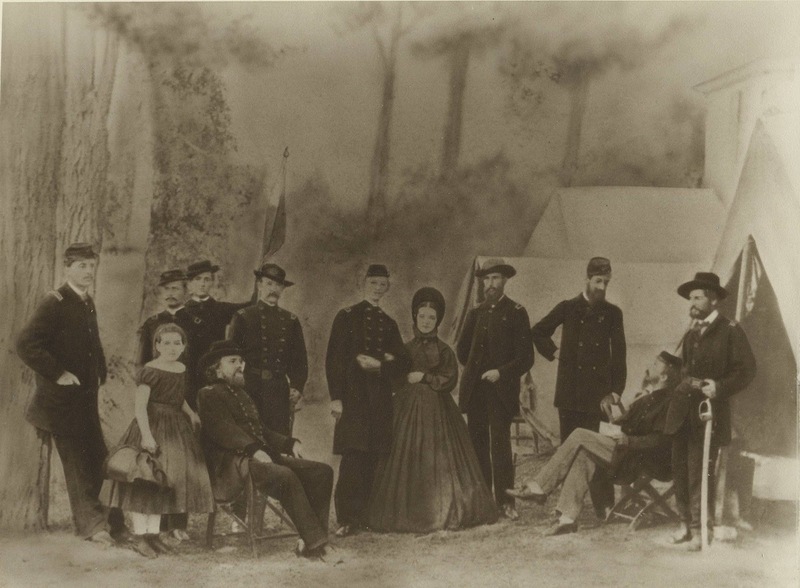 WHAT CAN WE LEARN FROM CIVIL WAR SERVICE RECORDS AND PENSION FILES? Did your ancestor serve in the war? Which side did they fight for - North or South? What was their title? Private, Lieutenant, Surgeon? Were they captured and put in prison as a prisoner of war? Did they die of a disease or injury? Were they killed in action? I learned when Hannah Wilson Lunceford/Lunsford died from a letter about her pension being dropped. I don't know about you, but I find this information fascinating. We can read or watch documentaries on TV about the Civil War. But, it brings it all to life when you have ancestors who lived during that time....and died fighting for their cause. There's more to learn from these files, but I'll stop for now. I hope this has peaked your interest and makes you want to go in there and dig and find out about your own family. Let me know what you find out. I'm always interested to hear your stories.